Rabbi of Kairwan; Biblical and Talmudical commentator; born at Kairwan about 990; died, according to Abraham Zacuto ("Yuḥasin," 98b), in 1050. It seems that his father, Ḥushiel, was his only master, but as by correspondence he learned a great deal from Hai Gaon, he was supposed by some French scholars, among them the tosafists R. Tam and R. Isaac (RI), to have been Hai's pupil. After his father's death, Hananeel and his companion Nissim b. Jacob ibn Shahin were named rabbis of Kairwan, and together presided over the school. Hananeel had, besides, a large business and was very rich, so that he left to his nine daughters a fortune of ten thousand gold pieces (Abraham ibn Daud, "Sefer ha-Ḳabbalah"). He was one of the first rabbis after the fall of the geonic school, and he contributed greatly to the spread of the study of the Talmud. In several places of Europe his name was well known, but not his origin, so that he was called by some scholars "Hananeel the Roman." He contributed largely to the revival of the Talmud of Jerusalem, which had up to his time been neglected, supplanted as it was by its younger companion, the Talmud of Babylon. Through his commentary to the Talmud he especially rendered great service in establishing the correct text of that work, of which he had before him the oldest manuscripts. Hananeel strictly followed Hai Gaon in his commentaries, in so far as the latter confined himself to plain interpretation and avoided mysticism. Of all the quotations from Hananeel made by later commentators, there is not a single one which is mystical in character. Hananeel certainly knew Arabic and also Greek, as is shown by his explanation of many Arabic and Greek words. But, unlike his companion Nissim b. Jacob, he wrote all his works in good Hebrew. He even composed an elegy on Hai Gaon in Hebrew verse. The works bearing Hananeel's name are: (1) A commentary on the Pentateuch, in which there is much directed against the Karaites. It is cited by many later Biblical commentators, chiefly by Baḥya b. Asher. Rapoport has gathered all the quotations from Hananeel made by Baḥya, and has published them in the "Bikkure ha-'Ittim" (xii. 34-55), and Berliner has added to these extracts those made by other commentators, and has published them, with Hananeel's commentary to Ezekiel, in the "Migdal Ḥanane'el." (2) A commentary to the Talmud, which was much utilized by Isaac Fasi (RIF), and Nathan b. Jehiel, the author of the "'Aruk," both of whom were supposed to have been Hananeel's pupils. The manuscripts of this commentary are to be found in Munich MS. No. 227, and contain the treatises Pesaḥim (published by Stern, Paris, 1868), 'Ab. 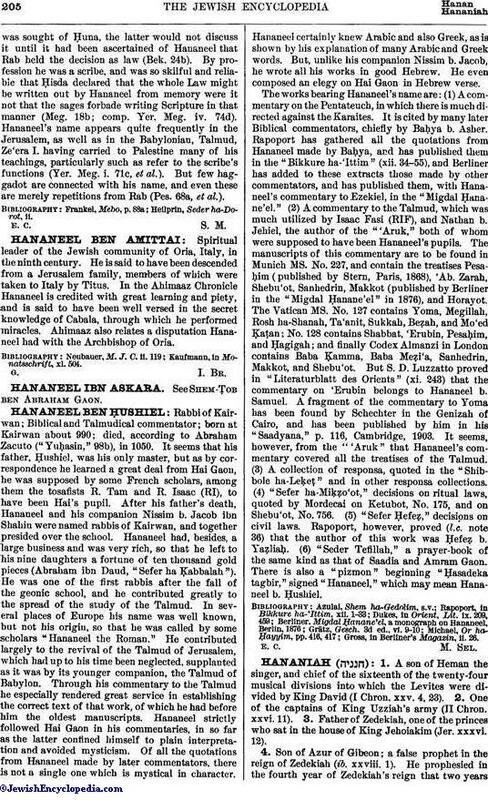 Zarah, Shebu'ot, Sanhedrin, Makkot (published by Berliner in the "Migdal Ḥanane'el" in 1876), and Horayot. The Vatican MS. No. 127 contains Yoma, Megillah, Rosh ha-Shanah, Ta'anit, Sukkah, Beẓah, and Mo'ed Ḳaṭan; No. 128 contains Shabbat, 'Erubin, Pesaḥim, and Ḥagigah; and finally Codex Almanzi in London contains Baba Ḳamma, Baba Meẓi'a, Sanhedrin, Makkot, and Shebu'ot. But S. D. Luzzatto proved in "Literaturblatt des Orients" (xi. 243) that the commentary on 'Erubin belongs to Hananeel b. Samuel. A fragment of the commentary to Yoma has been found by Schechter in the Genizah of Cairo, and has been published by him in his "Saadyana," p. 116, Cambridge, 1903. It seems, however, from the "'Aruk" that Hananeel's commentary covered all the treatises of the Talmud. (3) A collection of responsa, quoted in the "Shibbole ha-Leḳeṭ" and in other responsa collections. (4) "Sefer ha-Miḳẓo'ot," decisions on ritual laws, quoted by Mordecai on Ketubot, No. 175, and on Shebu'ot, No. 756. (5) "Sefer Ḥefeẓ," decisions on civil laws. Rapoport, however, proved (l.c. note 36) that the author of this work was Ḥefeẓ b. Yaẓliaḥ. (6) "Seder Tefillah," a prayer-book of the same kind as that of Saadia and Amram Gaon. There is also a "pizmon" beginning "Ḥasadeka tagbir," signed "Hananeel," which may mean Hananeel b. Ḥushiel. Gross, in Berliner's Magazin, ii. 26.